"The City of Steel and Stone"
Joliet is a city located on the 1926-39 Route 66 and the 1940 - 1977 ALT US 66. Elevation: Elevation 614 ft (187 m). Population 147,433 (2010). Joliet is a city in Will County (it is its county seat) which also spreads into Kendall County, Illinois. 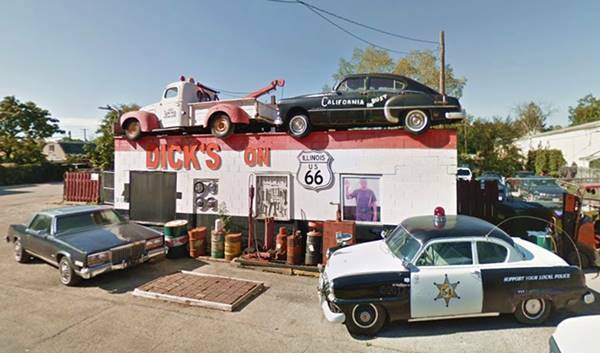 It is located on Route 66 and the later ALT US 66. (A Map of Joliet). At the end of the last Ice Age the paleoindians peopled the area (about 11,000 years ago), in more recent times, the first white explorers, French from Canada enocuntered Illinois and Potawatome Native Americans in the area. Two of these explorers, Louis Jolliet and the Jesuit Missionary Father Jacques Marquette paddled up the Des Plaines River in 1673 which runs through modern Joliet. The region became a part of their North American colony of Nouvelle France ("New France"). The river is 133 miles (214 km) long and flows south from Wisconsin, by Chicago and then with a southwestern course, it passes by Joliet and meets the Kankakee River to form the Illinois River which flows into the Mississippi River. It was a Native route and the French named it after the trees along its banks: "La Rivière des Plaines" (River of the Plane Trees). They named the American sycamore and the red maple after the European plane tree which they resembled. The Des Plaines was an Indian trade route as it had a short portage which linked it to the the Chicago River and the Great Lakes (read more about this Chicago Portage). France lost its Canadian colonies to England after the Seven Year War (1756-63) and the territories became part of the US shortly after. Fort Dearborn at present Chicago was built in 1803. First settlers sarted arriving in the late 1820s shortly after the state of Illinois was admitted into the Union (1818). The 1830s the Indian Removal Act forcibly removed all Indians west of the Mississippi River opening the area for farmers. In 1836 Will County was created. It was named for Dr. Conrad Will, a member of the first Illinois Constitutional Convention and member of the Illinois Legislature. Charles Reed built a cabin here in 1833 and the following year, James Campbell, treasurer of the Illinois and Michigan Canal laid out the town in 1834 and incorporated as a village named it "Juliet". Villagers rescinded their incorporation during the depression of 1837. The Illinois Legislature changed its name to "Joliet" in 1845. Pronounced either "Jew-lee-et" or "Jah-lee-et", and in 1852 it reincorporated as a city. A 1674 map based on Jolliet's expedition named a 60-foot (20 m) limestone ridge along the river as "Mount Joliet". (later mined as a quarry and now a depression). In the 1700s English speakers pronounced the French name as "Joo-lee-et" (in French it is: "Jolly-et") which when written became "Juliet", "Joliete" and so it appeared in the maps of that time. Jolliet, the explorer, had a French surname derived from "gai, joyeux, agéable (gay, joyful, agreeable). Work began on the Illinois and Mississippi Canal in 1836 and it was completed in 1848, later the railroad arrived. 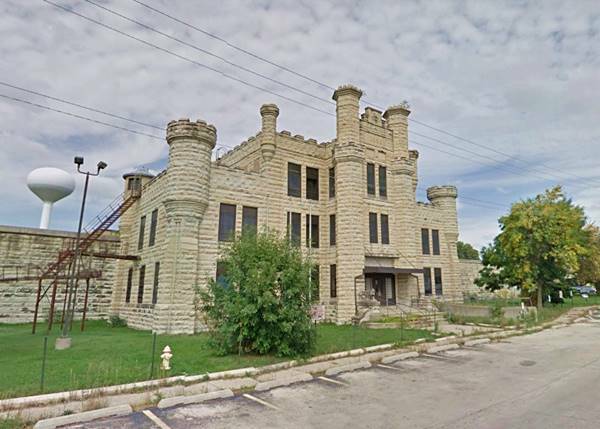 Joliet started as a farming community, it also quarried limestone but steel beame an important part of Joliet's economy when coal was discovered nearby in the 1870s. The Chicago Drainage Canal was dug in the 1890s, parallel to the old I&M canal, to be used not only for navigation but also to send the raw sewage of Chicago west so that it didn't taint its drinking water supply (Lake Michigan) and eliminate the constant cholera outbreaks. The Pontiac Trail passed through the town and Route 4 was built from Chicago through Joliet. When Route 66 was created in 1926 it followed the alignment of State Highway 4 until 1939. In 1940 the road was renamed US ALT 66 after a new US 66 was built further west, running between Braidwood, Plainfield and Willowbrook, this new US 66 bypassed Joliet. The climate of Joliet is a humid continental one with all four seasons distinctly represented; summers are hot and humid, spring is wet and cool, autumn is mild and pleasant while winters are quite cold. Temperatures: The average winter (January) high is 31°F (-0.3°C); and the average low is 17°F (-8.6°C). The summer average high (July) is 84°F (29°C) and the average low is 64°F (17.7°C). Rainfall ranges from 3 to 4.3 (78 and 110 mm) inch monthly from April to November, and falls to a drier 1.7 in. (28 mm) the rest of the year. On average, the town gets 36.82 inches of rain each year (936 mm). Snowfall: on average, 28 inches (71 cm) of snow falls each year in Joliet. The first snow falls in Nov. and the last (less than 1⁄4 inch or 8 mm) falls in April. There is usually no snow between May and September. The area that surrounds Joliet gets some 4 tornado strikes every year. Tornado Risk: read more about Tornado Risk on US 66. How to get to Joliet? 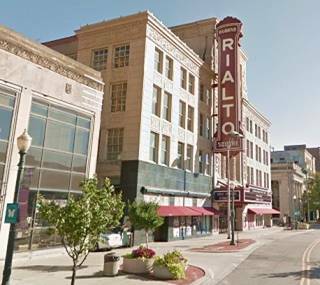 You can get to Joliet using Historic Route 66 or former ALt US-66 and also by using I-55 and taking Exits 253 or 257. US 30, US 6, US 52 and I-80 pass through Joliet, and I-355 runs east of it. Map of Route 66 in Joliet. Pale Blue: marks the 1926 - 1939 US 66 and the 1940 - 1977 ALT US 66 in Joliet. Red line or gaps in alignment, is I-55, where it overlaps the old alignment. Black are the sections that are missing. Check each individual city for its specific color key. Route 66 is a Historic highway and has also been designated as a National Scenic Byway and an All-American Road in the state of Illinois. 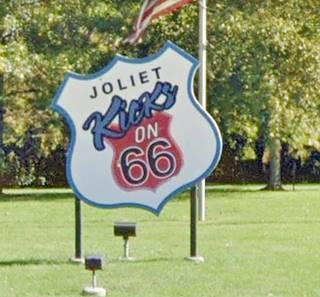 Below you will find More information on Route 66 in Joliet. In 1946 Jack DeVere Rittenhouse does not mention it in his 1946 "Guide Book to Highway 66" because he drove the "Main US 66" through Plainfield and Braidswood, bypassing it. The 1939 WPA's guide to the state of Illinois mentions Joliet in its Route 66 tour: with a reference to the "new modern prison for men" in Stateville and then the town itself: "Points of Interest: Joliet Wall Paper Mills, American Institute of Laundering Vocational Training School, Oakwood Mound". Begin your tour at then north side of town at Romeoville; drive south from Romeoville to Joliet. At Crest Hill the main attraction to Crest Hill is Stateville Prison located just off Route 66. Ahead, to your left at Moran and Broadway is the famous Rich and Creamy Ice Cream Stand with Jake and Elwood Blues (the Blues Brothers) dancing on the rooftop next to the giant ice cream cone. The city purchased the building and neighboring property in the early 2000s for a development plan (Broadway Greenway) including a water park and marina, but barge operators objected and it was scrapped. So Joliet is the landlord of the ice cream parlor. It even considered demolishing the stand for safety reasons because it was too close to the road, for safety reasons. 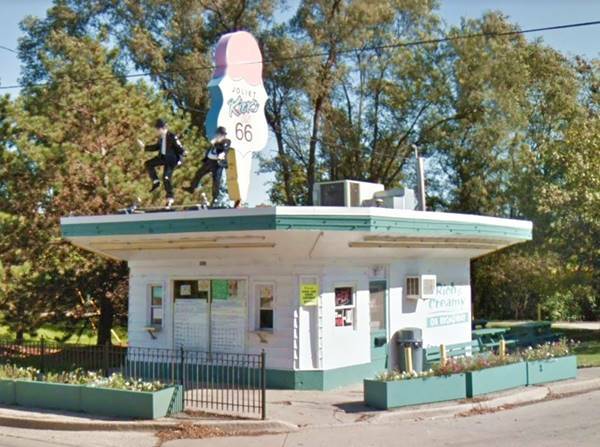 It has been there since 1976, and was known as "Creamy delight" formerly it was a mobile home sales office built in 1965. The bridge has one main span and 3 approach spans and carries US-66 across the Des Plaines River. It was built in 1935 and has a total length of 396 ft (121 m). It is movable, to allow ships to pass. See its Street View. Southbound traffic went along the fork to the right via Ottawa St.
Northbound traffic followed Scott St. The oiginal aligment until 1940 along Chicago St. is now cutoff at the County Courthouse between Jefferson and Washington Streets. Sherb Noble owned three ice cream parlors in Kankakee Illinois and his ice cream suppliers, the McCullough's told him about a new soft frozen dairy product they had developed. He tried it at his stores and it was a success. 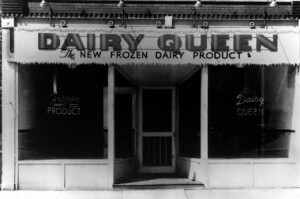 The McCullough family went on to estabish Dairy Queen and their friend, Novle opened the first store named "Dairy Queen" in Joliet. By 1941 they had opened 10 stores, growing to 100 by 1947 and 2,600 by 1955. 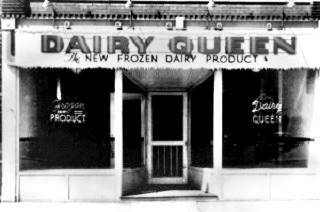 The oval brass plaque says "Original Dairy Queen Store - Established 1940 - Building Erected ca. 1895 - Joliet Local Landmark". On the SW corner of Cass St. and N Chicago St. 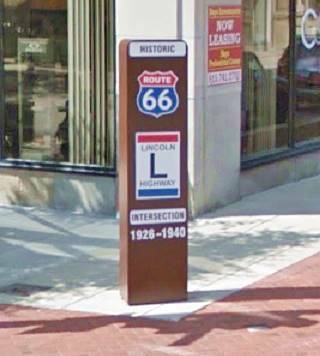 Here is a 7-foot tall steel marker that reads "Historic Route 66 Lincoln Highway Intersection 1926-1940"
The Lincoln Highway was a private initiative to actively promote decent roads for cars (instead of muddy dirt tracks used by carts). The owner of the Prest-O-Lite Headlight Co., Carl Fisher got the support of his fellow automobile industry businessmen and founded the Lincoln Highway Association in 1913 to build a road from New York city to San Francisco. It was the first transcontinental highway across America, spanning 3,400 miles. In 1926 Route 66 crossed its course here in Joliet. 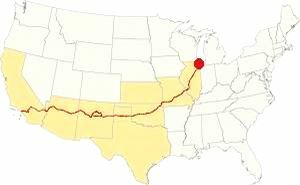 The two longest highways in the world at that time met in Joliet. Today the Illinois alignment of the Lincoln Highway is an Illinois State Scenic Byway and also a National Scenic Byway. US 66 and the Lincoln Highway cross each other twice in Will County. Here in Joliet and on the 1940-58 alignment of US 66 in Plainfield. 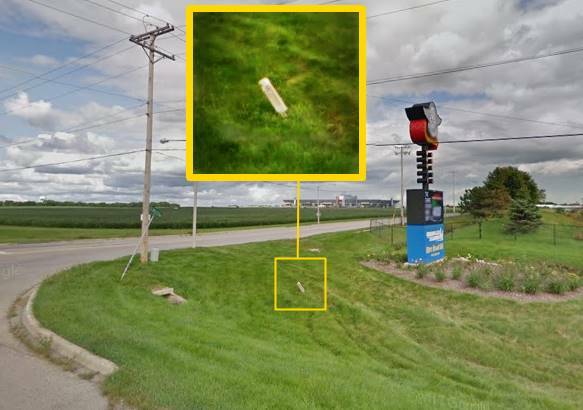 Read more about: US 66 and Lincoln Higway in Plainfield. 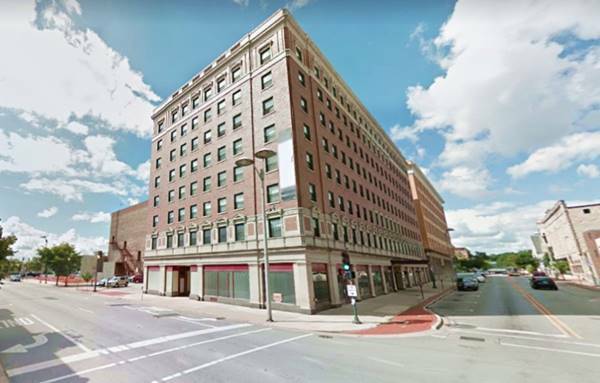 Designed in commercial classical style by Raymond Hobbs it was built in 1910 and housed the Hobbs Hotel, a grocery, a florist and a cafe. 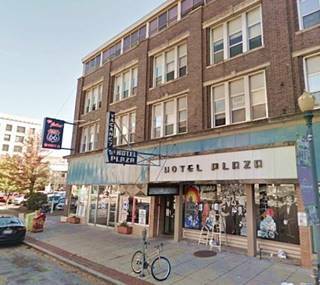 It was run by Hobbs until the 1940s when it was sold to new owners becoming the Plaza Hotel. A third floor was added later. It is pictured above. Ths station was built in 1912 and its "Grand Ballroom" has crystal chandeliers and 45 foot ceilings. 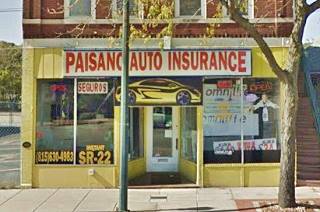 This is its street view. 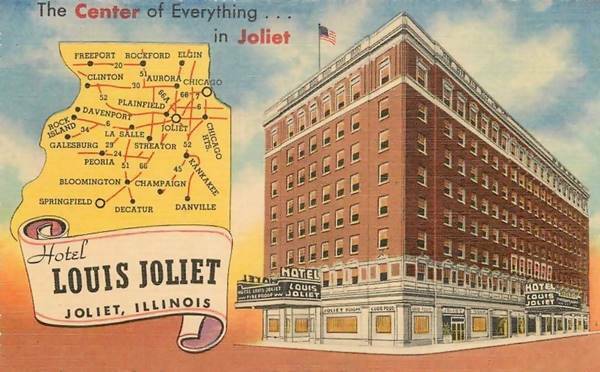 The luxurious hotel was built in 1927, just one year after Route 66 was aligned through Joliet. Its postcard pictured below says "Modern - Fireproof, Famous for fine food - Louis Joliet Famous French Expl.". It is an eight-story building with 225 rooms with an two-story lobby housing an enormous fireplace. It closed in 1964 and since has been refurbished and sold as apartments. At Ohio road turn left for a short (2 mile round-trip) to visit the Collins Street Prison & Prison Park, see this Map with directions. The old Prison with its limestone walls and its Medieval castle appearance was built in 1858 using forced labor of prisoners. The walls are 25 feet high and 5 feet thick. It closed for good in 2002. This former "Joliet Correctional Center" housed 1,300 inmates. It has appeared in the TV series Prison Break and the 1980 movie The Blues Brothers. The cult classic movie "Blues Brothers" (1980) directed by John Landis starring John Belushi, Dan Ayroyd as "Joliet" Jake Blues and Elwood Blues respectively, they are brothers (originally characters from Saturday Night Live). Abundant coal and good communications in the 1870 made Joliet an ideal spot to manufacture steel. The plant is now closed but there is a self-guided tour along a paved trail to learn more about it. A 18 mile round trip along US 30 Map with Directions. The Oakwood Mound is situated south of the main entrance of Oakwood Cemetery. The cemetry was established in 1855. It is a Woodland period mound from 1,000 AD, and it once stood 8-feet high, now it is only 4 feet high after archaeological excavations by the University of Chicago in 1928. It contained the remains of more than 300 persons, probably disposed of rapidly. At the Lincoln-Way Central High School is an informational gazebo and next to it is the original 4-foot tall concrete marker from 1927 with the distinctive logo, directional arrow, and a bronze Lincoln head medallion. An original route marker of the Lincoln Highway before such markers were replaced by U.S. highway shields. 832 Plainfield Rd. 1.5 mile drive. See this Map with Directions. 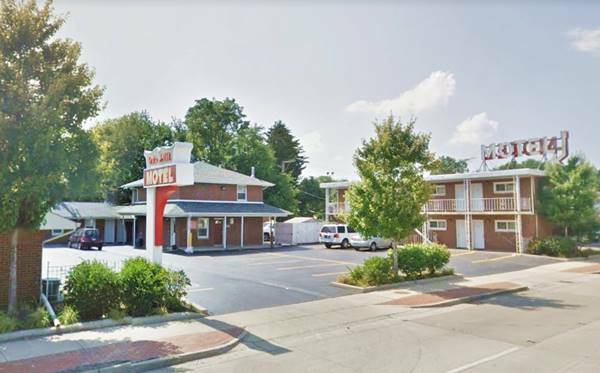 The motel is still open, and lodging guests. The postcard tells us that it had "20 Units with combination tub and shower in all rooms... magic fingers - swimming pool... In town between Shopping Center & Downtown" (what are Magic Fingers?). Head south towards Elwood along US 66. A 15 mile drive tip to tip (Map with Directions). The Blues brothers drive around in the "Bluesmobile" a former police car, a 1974 440 Dodge Monaco. The gadget on the roof is a loudspeaker. According to Dan Aykroyd, the horn-shaped loudspeaker is a duplicate of the one back at his school in Ottawa Canada. It was a Cold War siren. With a 1.5 mile oval it hosts NASCAR events and ARCA Racing series. A quarter mile drag strip and a half mile dirt oval it annualy hosts the NHRA National Drag Racing events and Demolition Derbies. As its postcard tells us, it was located on "Rte 66 (I-55) and US 6". 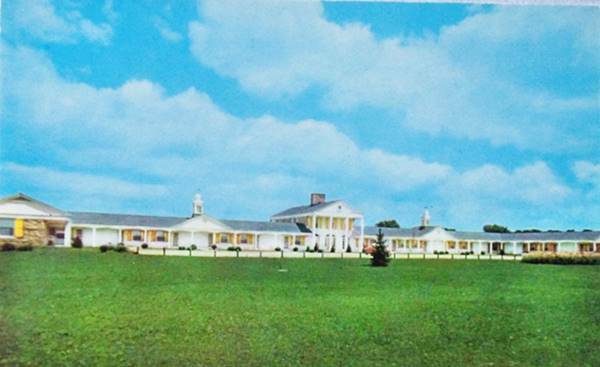 Its relaxed colonial style building is virtually unchanged, and it is still operating as a motel. 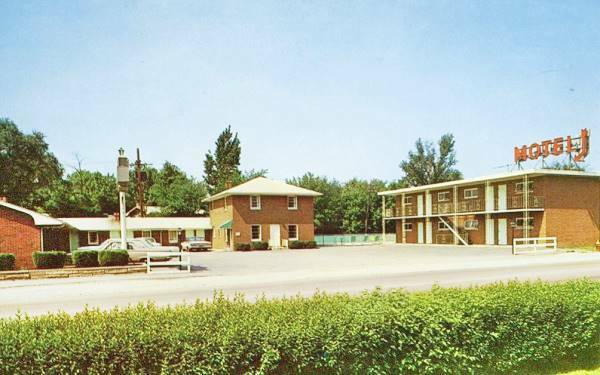 The Manor Motel is listed by the National Park Service as one of the "ca. 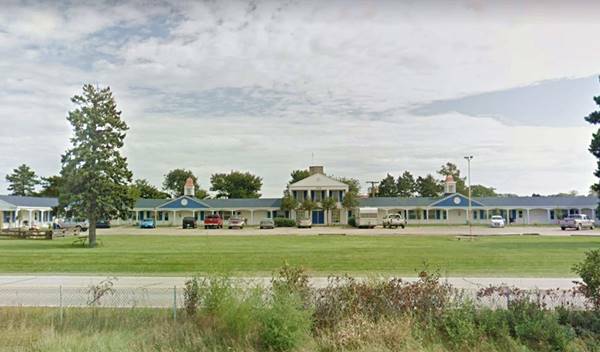 1935-58 motel buildings remaining on Route 66 in Illinois", it describes it as follows: "Brick, U-shaped 1 and 2 story, colonial style motel with end gable roofs. 77 units. Ca. 1950s". From here you can head north along the 1940-58 US 66 alignment in Plainfield or south into Braidwood or return to Route 66 and go on, to Elwood. Illinois funded its original state highway network by floating a bond in 1918. Among the roads built was SBI 4 (State Bond Issue) along what had been the "Pontiac Trail" that ran from Chicago to St. Louis. Originally it was aligned to the northeast of Joliet, through Lockport into Lemont, bypassing Romeoville; Route 4 was paved completely by 1923, but in 1926 it became Route 4A after a new Route 4 was built from Joliet north through Romeoville. It became Route 66 in 1926. Route 66 which nowadays is IL-53 ran through Joliet between 1926 and 1939. In 1940 a new and straighter alignment built through Plainfield so the old alignment became ALT US 66 from then until 1977. This new road was built from Gardner to Plainfield and then NE towards the old alignment, which it met north of Romeoville. The 1928 Illinois state roadmap shows the original US 66 and the other highways in the region (IL-4 and Il-4A), it also marks Joliet (left of center). The new "MAIN" US 66 is marked with a Green Line in the google map further up. The old road from Romeoville ran south to Joliet, Wilmington, Braidwood, Braceville and Gardner as ALT US 66; the Pale Blue line marks these 1926-39 US 66 and 1940-77 ALT 66 alignments. In 1958 US 66 was moved further west to a brand new freeway that bypassed all the towns including Plainfield, Braidwood and also Gardner. US 66 and I-55 shared the freeway. The American Association of State Highway and Transportation Officials (AASHTO) created the "Alternate" designation in 1959. Its purpose was to designate a route that branches off from the main highway, passes through given towns or cities and then connects again with the main numbered route. The idea is to accommodate a high traffic demand. When the Alternate and Main highways followed a similar course, the shorter and better built highway would be marked as main and the other as alternate. 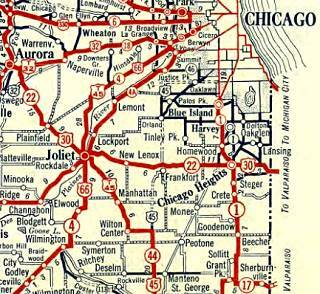 In 1940 Route 66 north (east) of Joliet, all the way to present Wellco Corners had been designated as ALT 66. And Route 66, the main highway now ran along a new highway parallel to the old one, on the western side of the railroad from Braceville and a point just north of Joliet. Here it turned sharply and took a straight course northward, crossing the Kankakee River and passing by "Blodgett", then it crossed the Des Plaines River and intersected US 6, passed by "Birds", intersected US 52 and finally reached Plainfield where it met US 30 and turned with a northeastern course towards Cicero and Chicago. It met the ALT 66 at Wellco Corners. There are only three places along Route 66 where an Alternate alignment existed: this one into Chicago, one in Oklahoma City and the one leading into Los Angeles CA. Drive 8.8 miles from Romeoville to Joliet: Map with directions.